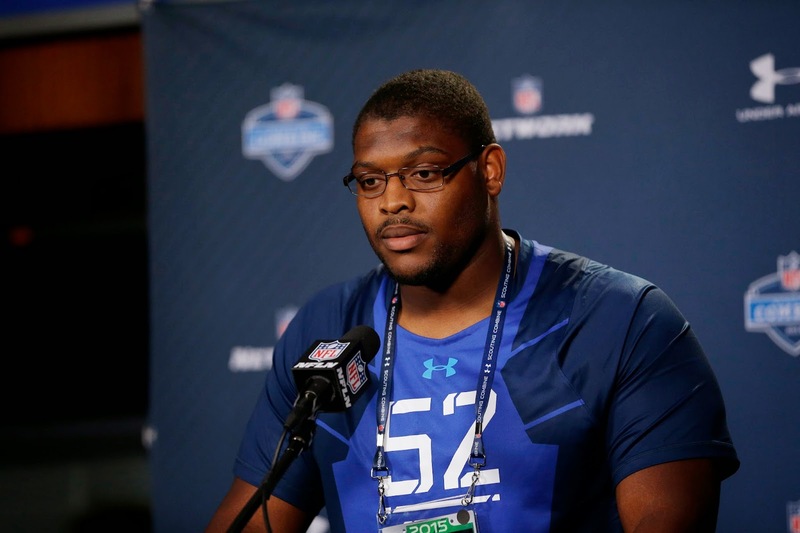 Laken Tomlinson, a guard from Duke, was drafted by the Detroit Lions with the 28th pick in the NFL draft on Thursday night. Tomlinson, who is 6-3 and 323 pounds, aspires to be a neurosurgeon after football. Has thick buildd and is as wide as a refrigerator or a Coke machine depending on which scout is describing him. Tomlinson could start at left guard where there is an opening although the Lions also received Manny Ramirez in the trade with Denver. The Lions had the 23rd pick in the first round but made a trade with Denver and moved down five spots. In the trade they got an extra fifth round pick this year, guard Manny Ramirez and a fifth-round pick in 2016. The Lions have six more picks in the draft which continues on Friday at 7 p.m. with rounds two and three. The draft wraps up starting at noon on Saturday with rounds four through seven. It is televised live on ESPN and the NFL Network. NFL Draft weekend is finally here. The first round of the draft starts at 8 p.m. on Thursday. My top five draft prospects for the Lions with the 23rd overall pick. A look at why the first round is so important. The Lions’ biggest needs on defense and which prospects could be available to help. The Lions’ biggest needs on offense and which prospects could be available to help. Running back Tyler Varga, an interesting character, could be a good late-round pick. Basic information for the draft including times and TV information. A look at the experts’ mock drafts and who they have the Lions drafting in first round. If you missed the chat today (Thursday) just hours before the NFL draft, check out the transcript here. Plenty of good questions and, as you would expect, most on the draft. The Lions have the 23rd pick along with picks in five other rounds. The next chat is at 3 p.m. on Thursday, May 7. 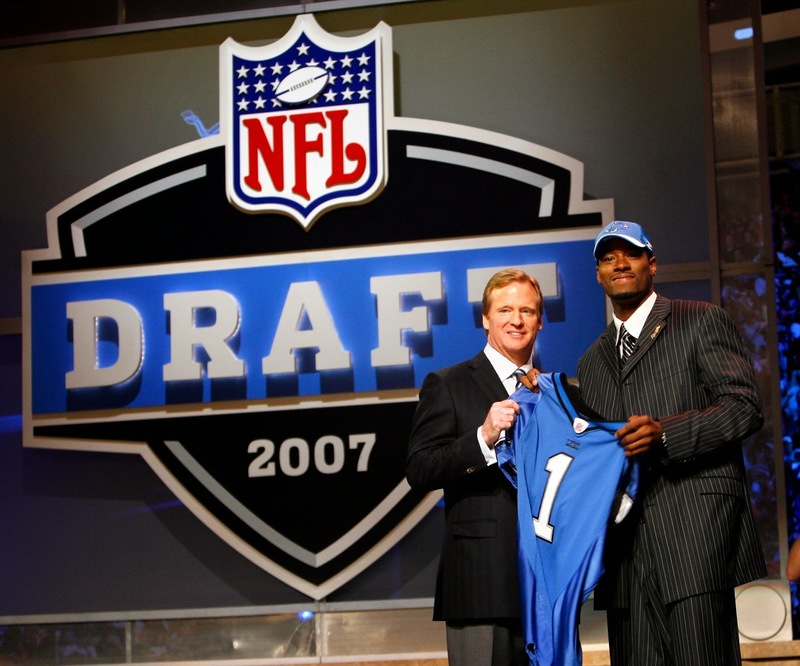 In the photo that's a skinny-looking Calvin Johnson back on his draft day. Here I go, jumping on the Tyler Varga bandwagon. It’s not too late is it? There appears to be plenty of room. Who is Tyler Varga? He’s one of the most under-rated players in the draft according to NFL Network analyst Charles Davis. 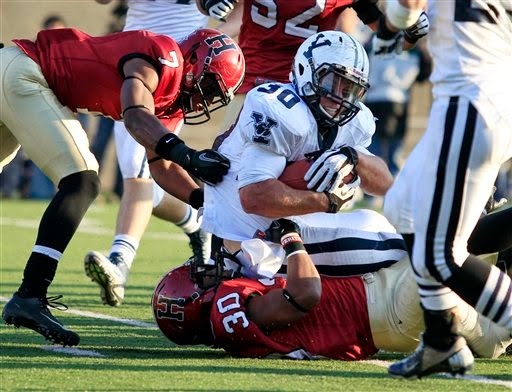 Varga was a running back at Yale and could be a running back/fullback hybrid in the NFL. Sounds like a perfect fit for the Detroit Lions in the fifth, sixth or seventh rounds. Varga (5-foot-11, 222 pounds) has a most interesting background. His mother and father were bodybuilders. When he appeared on the Dan Patrick Show on Wednesday his muscles popping out from a Yale shirt that appeared two sizes too small. He scored a pair of rushing touchdowns at the Senior Bowl where he was definitely a standout. He was named the North team’s captain before the game which obviously means he displayed leadership qualities. Although he played only tailback at Yale and in high school, he was asked to take a few snaps at fullback at the Senior Bowl. In 2014 he rushed for 1,423 yards and 22 touchdowns in leading Yale to an 8-2 record and a second-place finish in the Ivy League this season. Varga is interesting enough that ESPN will be at his house on Saturday for the NFL draft. On the Dan Patrick Show he said the consensus from scouts is that he’ll be drafted. He’s not so confident that it will be on any day other than Saturday in rounds four through seven. He’s smart too. Proof? He speaks three languages and was an ecology and evolutionary biology major which he said translates to pre-med. Medicine is his long-term goal. For now, he wants to play football. Varga, who was born in Sweden and then moved to Canada, played five positions in high school and scored more than 100 touchdowns. According to his Yale bio, he’s also had a competitive history in AAA baseball and alpine ski-racing. 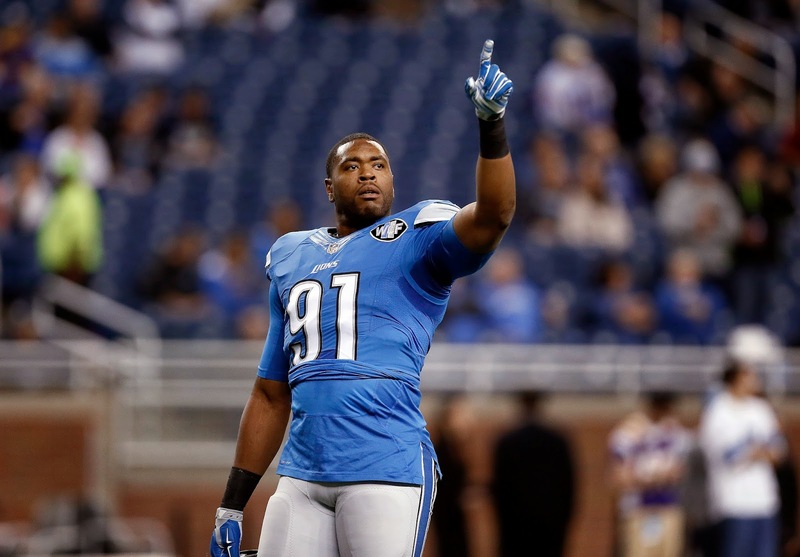 — Lions will pick up the fifth-year option on left tackle Riley Reiff. The paperwork is being done now. The deadline for the decision is May 3. Mayhew said he’s comfortable with Reiff at left tackle or at right tackle. — Mayhew does not seem too upset about the absence of safety James Ihedigbo from this first week of voluntary offseason work. Mayhew said he understands because there were times in his NFL playing career he felt he was underpaid. He would not say if they will re-work deal for Ihedigbo but he did say he was looking forward to talking to him. He mentioned that one player missed last year’s voluntary workouts and he wasn’t upset about that either. He failed to mention that guy’s name. It was Ndamukong Suh who reported to the Dolphins this week for voluntary workouts. — Mayhew sat down and talked with G/C Rodney Austin following his domestic violence charges from last week. He decided to release him now, but didn’t close door on bringing him back. Will wait until legal issues are sorted out. — Both sides are interested in extending contract of DT Haloti Ngata, but talks have not started yet. — An offer was made to left guard Rob Sims three weeks ago and Mayhew is waiting for response. Not sure if Sims will return. — Lions draft board is 95 percent done with draft six days away. — DeAndre Levy’s wing-walking didn’t surprise him, but he’d prefer his players keep their feet on the ground and stay safe. That includes Matthew Stafford who sky-dived on his recent honeymoon in New Zealand. No running back has been drafted in the first round since 2012. Could the Lions go that direction in the NFL draft that starts next Thursday? NFL Network analyst Mike Mayock sees it as a possibility. 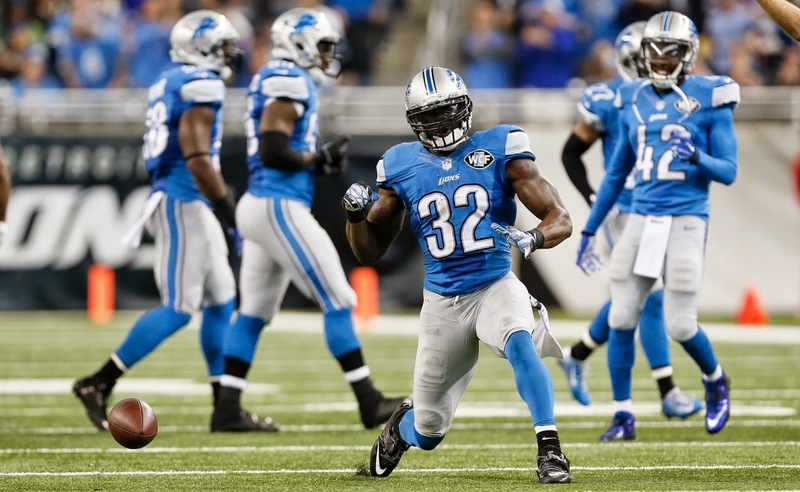 “I’ve got running back as a significant need (for the Lions),’’ Mayock said during a conference call on Thursday. “They’re game-changers. You have to balance what kind of team you want to be. You look at (the Lions) and they were 28th or 29th in the league last year in the run game. They throw the ball a lot and they throw it well. Are they going to change the balance to accommodate that guy or not? “I love those two tailbacks. Really, it comes down to the team evaluation. You have to decide up front if one of those guys are there you’re taking them, if not you’re going the other direction,’’ Mayock said. The Lions indeed were 28th, averaging 88.9 yards per game and that was with Reggie Bush who was released after the season. Mayock gives Gordon a slight edge over Gurley who is coming off ACL surgery. “To be honest with you they’re difference makers. 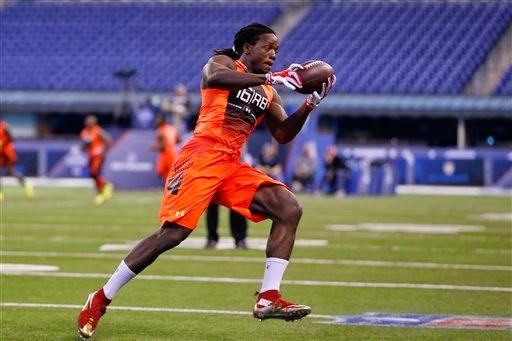 One of those guys would be really hard for me to pass up (at 23),’’ Mayock said. With the 23rd overall pick in the draft, Mayock says the Lions need to let the board come to them. This reflects the philosophy of general manager Martin Mayhew who always says he drafts the best player available. Most experts, including Mayock, agree that the draft has an elite class of running backs and also wide receivers. 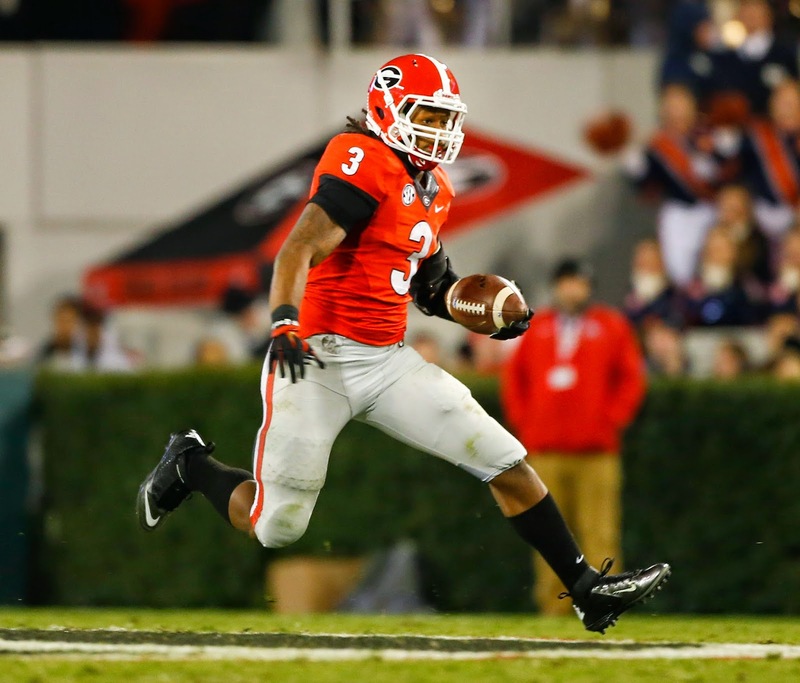 If the Lions don’t grab Gurley or Gordon, they’ll have chances in later rounds to pick up a quality running back. There’s also a lot of depth in the draft for offensive and defensive linemen. The biggest factor will be who is available when the Lions pick. Mayhew always goes for the best player available. Don’t expect it will be any different next week. 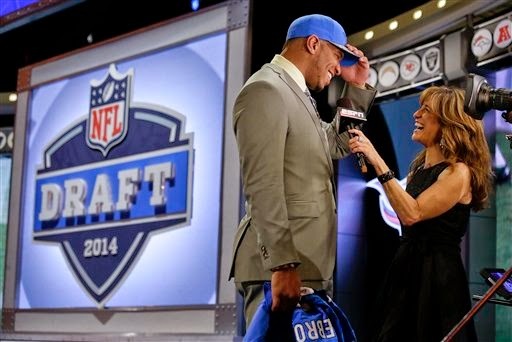 The NFL draft starts at 8 p.m. on Thursday, April 30, with the first round. Then it starts back up at 7 p.m. on Friday, May 1, with the second and third rounds. Saturday’s final day with rounds four through seven starts at noon. 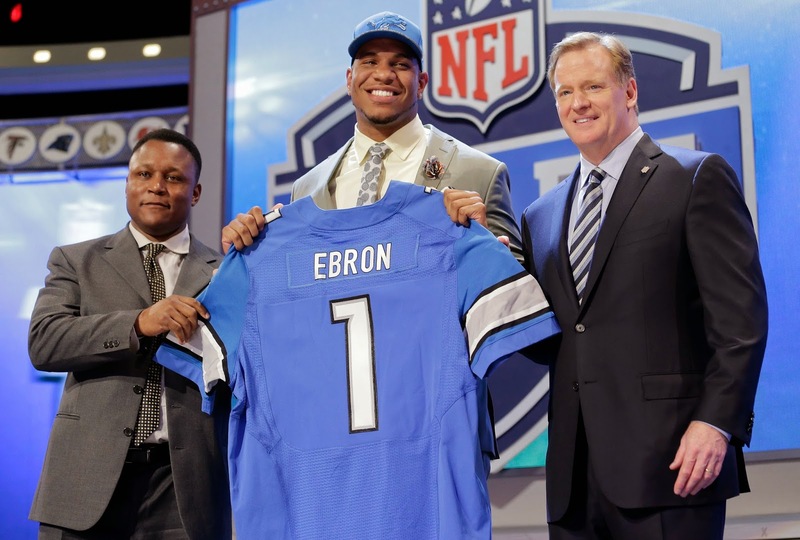 A year ago tight end Eric Ebron was the Lions first-round pick, next Thursday the Lions will have the 23rd overall pick. When Glover Quin was asked about the Lions 2015 schedule which was released Tuesday night, the first thing he said was that he was not going to go game by game through the 16-game schedule for the media. Fine. Then without much prompting — the safety loves to talk — he went through the first half of the schedule. Quin sees the Lions at 7-1 heading into the bye week. That’s almost hard to believe because the schedule is not easy, but Quin has his reasons and he explained them in full detail. “We open with San Diego, so I said, ‘OK it’s a road game for us all the way across the country.’ But I felt like if San Diego plays their best game and we play our best game I feel like the Detroit Lions we should beat San Diego. So iI gave us 1-0. “We go to Minnesota that’s a division game we have to win that one. I feel we can go on the road and we will beat the Minnesota Vikings. That gives us 2-0. Then he backs off a bit. “That sets up for a perfect trip to Seattle and you’ll have to see how that one plays out,’’ Quinn said. He got a roar of laughter from the media on that one. “I’m not going to say we’re going to go 4-0. I’m not going to say we’re going to lose. I look at Seattle playing in Seattle and I look at us as Detroit Lions. If they’re playing their best and we’re playing our best, it’s going to come down to one or two big plays in the game. Whoever makes those plays is who’s going to win. That’s how I look at it. Give Quin some credit, he had thought this one through. “When I do my schedule those are the games that I just say we lose. So I give us 3-1 granted we could beat Seattle and lose in Minnesota whatever. I give us 3-1 coming out of the first quarter,’’ said Quin who thinks the defense will be elite once again this season. “I’m not going to go through the whole schedule,’’ he said again and then — without prompting — he went through another four games. “I think it’s a tough schedule if you just look at the schedule. I think it’s a tough schedule but I think it’s favorable for us, the matchups the teams that we play,’’ Quin said. “The last two seasons we’ve had to go to Arizona and we played them tough in Arizona (and lost both). So this year Arizona has to come to us (Oct. 11), so we owe Arizona. We should take that one. Then I think we’ve got Chicago. it’s a division game we’ve got to win our division games, we’ve got to beat Chicago. “After that we’ve got Minnesota again, that’s a chance to sweep Minnesota early in the year. And that’s another division game and it’s a home game for us so we have to beat Minnesota. So that’s 6-1,’’ Quin added. The Lions wrap up the first half of the season with a trip to London for the second straight year. They rallied and beat the Falcons at Wembley Stadium last year so they have fond memories and know what to expect. Now they just have to play the games. 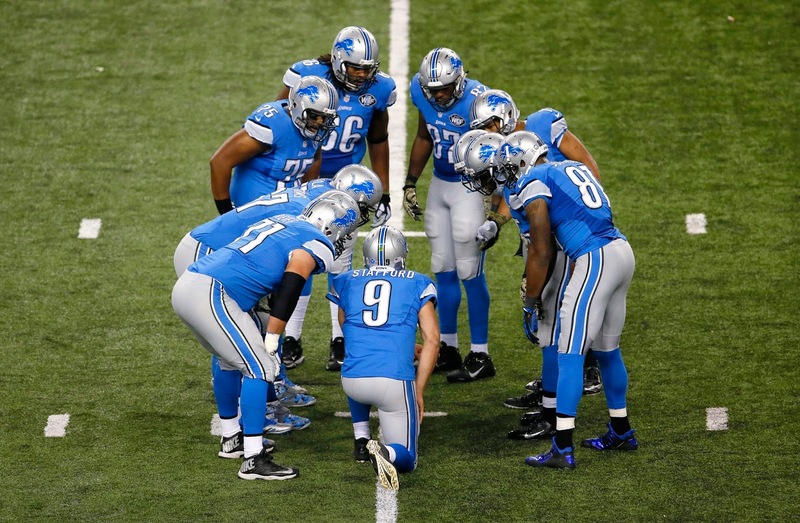 So what does the 2015 schedule mean for the Detroit Lions? A trip to the playoffs for the third time in five seasons? Or not. One thing for certain, they need to be road warriors. The Lions will open the 2015 season with three of their first four games on the road — at San Diego, at Minnesota and at Seattle. That’s a handful. Seattle has that 12th Man thing going boasting the loudest stadium in the NFL. Imagine the fans will be extra full of good cheer for a Monday night. Plus the Seahawks are coming off a Super Bowl loss and a 12-4 season. Then the Lions wrap up the season with three of four on the road — at St. Louis, at New Orleans (another Monday night game) and at Chicago on Jan. 3 to wrap up the regular season schedule. In 2014 the Lions finished 11-5 and were 4-4 on the road. Certainly a positive sign. They have to keep it up to get to the playoffs for a second straight year. 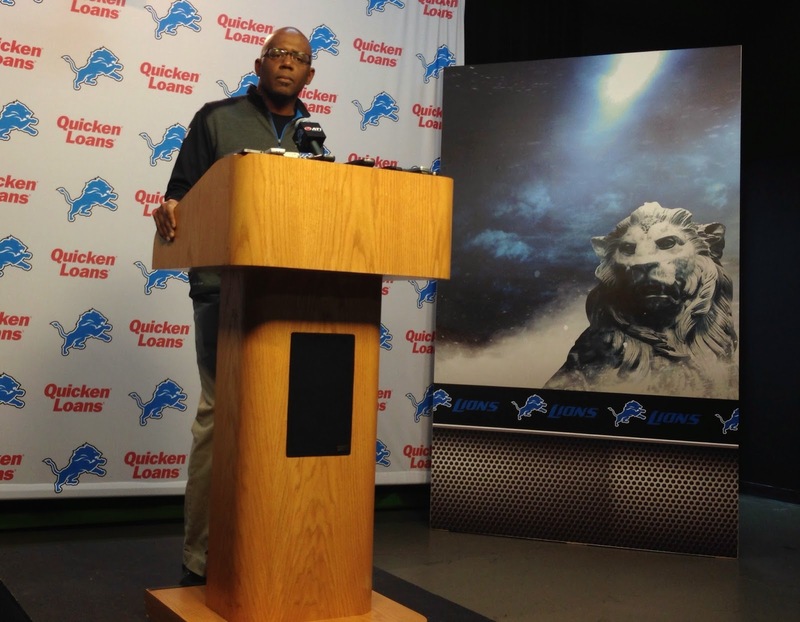 Coach Jim Caldwell preaches that he wants his team to be ready to play anywhere at any time. It’s likely the coach will be singing the same tune after seeing this schedule. Still, this won’t be easy. The Lions were 5-1 against NFC North opponents last year. It will be difficult to match or top that. They get a break playing at Minnesota on Sept. 20. The Vikings will be playing outdoors at the University of Minnesota’s stadium so playing before the snow (well it should be before the snow) should help. They the have back-to-back home games Oct. 18 and 25 against the Bears and Vikings. Detroit plays at Green Bay on Nov. 15 and then hosts the Packers on a Thursday night game on Dec. 3. Remember the Lions haven't won in the state of Wisconsin since 1991. The Lions wrap up the NFC North schedule on Jan. 3 at the Chicago Bears where it indeed will most likely be snowing and blowing. The Lions do have an advantage by playing the Chiefs at Londons’ Wembley Stadium on Nov. 1. First, Detroit has pleasant memories after rallying to beat the Falcons at Wembley in 2014. Second, they won’t be strangers. They will know exactly what they are getting into with the trip overseas. It’s a little early to pick wins and losses since we don’t know the full roster. However, I do see 11-12 possible wins. What do you see? Sept. 13 — At San Diego Chargers, 4:05 p.m. Offensive lineman Rodney Austin has been released by the Detroit Lions following an arrest last week, according to the team web site. Austin was arrested on Friday by the Mecklenburg Police in North Carolina. He was charged with assault on a female, interfering with emergency communication, assault of a child under 12 and misdemeanor larceny. All are misdemeanor charges. Coach Jim Caldwell has often warned players about the high cost of low living. Austin was one of the Lions’ few options at left guard. There has been talk of re-signing Rob Sims who has started every game at left guard for five seasons, It hasn’t happened yet. Also the Lions could fill the position through the draft. 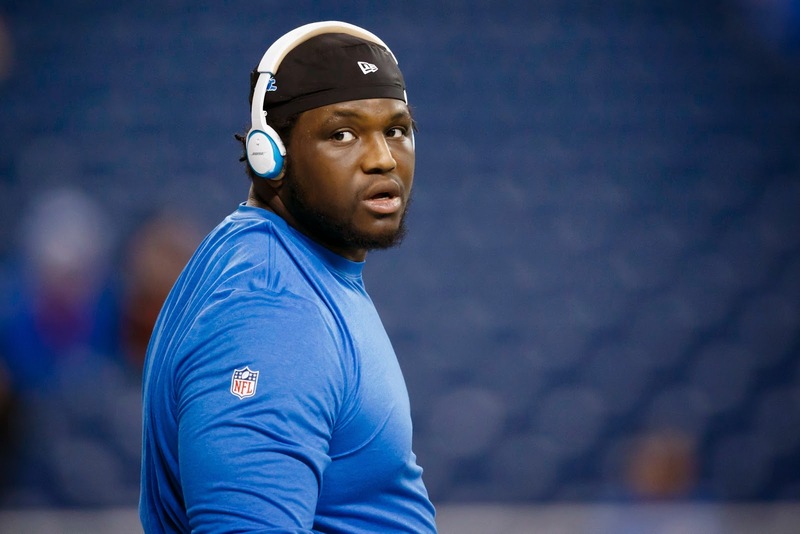 Austin, 26, has been with the Lions since 2012 spending most of his time on the practice squad. He was signed to the active roster in November 2014. He played in one game in 2013. Not that there’s much dead time in the NFL, but Monday marks the start of an intense stretch. Offseason workouts started today (Monday) for the Lions and the 24 other NFL teams that have returning head coaches. 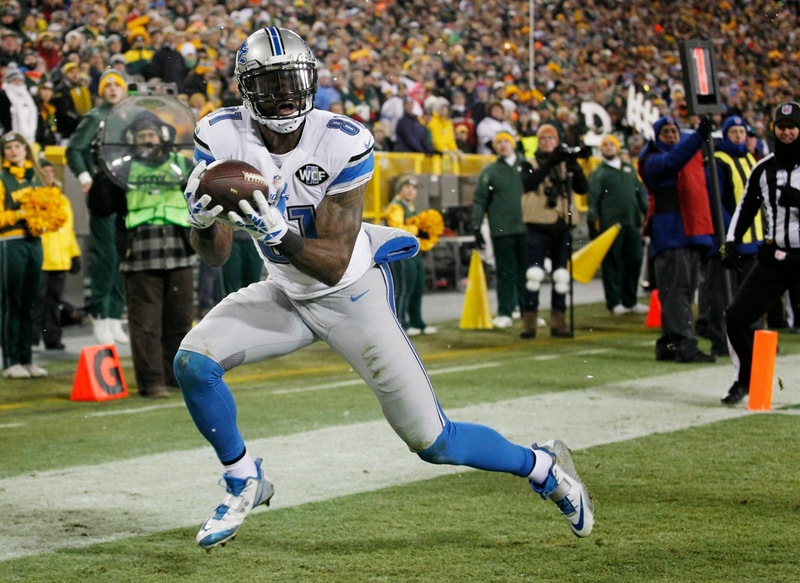 James Ihedigbo was the only missing player for the Lions, according to the team web site. These workouts are voluntary, but attendance is expected. The NFL monitors teams to make sure they are not breaking the rules. The NFL schedule will be released at 8 p.m. on Tuesday on the NFL Network. We know home and road opponents just waiting for dates. The Lions home opponents in 2015 will be: The Chicago Bears, Green Bay Packers, Minnesota Vikings, Arizona Cardinals, Denver Broncos, Oakland Raiders, Philadelphia Eagles and San Francisco 49ers. The road opponents: The Kansas City Chiefs in Week 8 of the regular season at Wembley Stadium in London on Nov. 1. Other road opponents: Chicago Bears, Green Bay Packers, Minnesota Vikings, New Orleans Saints, San Diego Chargers, Seattle Seahawks and St. Louis Rams. The preseason schedule has been released. The Lions will continue to host pre-draft visits this week. The three-day NFL draft starts Thursday, April 30. Ndamukong Suh, who didn’t attend the first few weeks of the offseason workouts with the Lions a year ago even with a new coach at the helm, is in attendance at the Dolphins’ first workout on Monday according to the Miami Herald’s Armando Salguero. Suh said last year that he was more comfortable working out with his own people. Perhaps you’ve heard Tim Tebow is back in the NFL at least for now. The Eagles have signed him, but there’s no guarantee he will make the 53-man roster. The 2007 Heisman Trophy winner has been out of the NFL for two years. 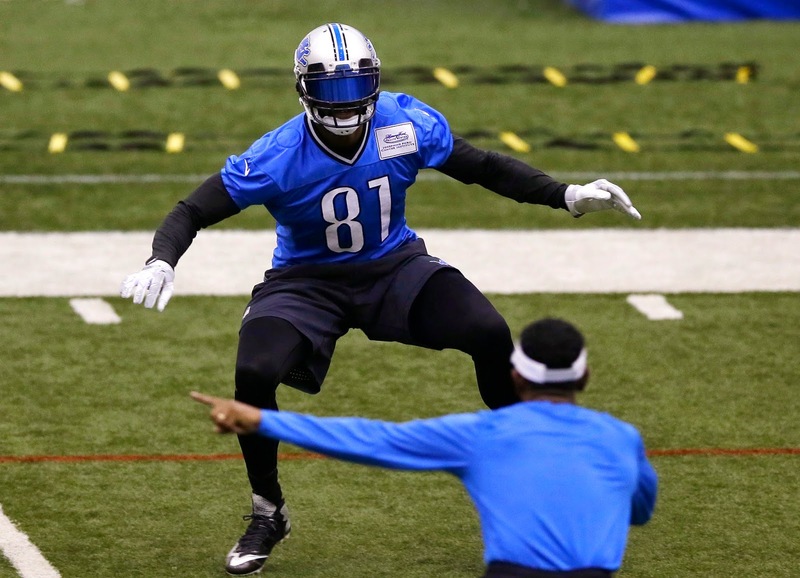 Monday is the first day of the Detroit Lions’ offseason program which will end in mid-June with a mandatory minicamp. It will be the first time that new acquisitions like Haloti Ngata and Tyrunn Walker can work out with their Lions' teammates. Following the stipulations of the collective bargaining agreement, the NFL offseason plan begins slowly. Starting on Monday and during the first two weeks they are allowed strength, condition and rehab work only. Strength and conditioning coaches are allowed to work with the players but no other members of the coaching staff are allowed. Footballs can be used for punting and kicking. Also quarterbacks can throw to receivers who aren’t covered. Coach Jim Caldwell and his staff can be involved in classroom instruction and film study up to two hours a day, but the player can’t be at the facility for more than four hours per day. Phase Two lasts for three weeks and allows individual player instruction and drills. It also allows team practice without live contact, or team offense vs. team defense drills. Offensive or defensive plays are allowed, but without an actual defense or offense on the other side of the line of scrimmage. Helmets must be left in the locker room. Phase Three, which last for four weeks with up to 10 days of practice, is technically known as organized team activities. No live contact is allowed in OTAs, but team drills (7-on-7, 9-on-9, 11-on-11) are permitted. Also, there can be no one-on-one offense vs. defense drills and no one-on-one special teams drills. During the first two phases players can’t be at the facility more than four hours per day and or more than four days a week. Also, they can’t be on the field for more than 90 minutes a day. The NFL randomly monitors practice tapes on each team to make sure the rules are followed. In 2010, the Lions lost two days of OTAs due to the intensity and tempo of the drills under coach Jim Schwartz. Also the Lions were penalized for similar situations in 2006 under coach Rod Marinelli. A year ago, Ndamukong Suh skipped the first two phases which are voluntary because he preferred to work on his own. Lions defensive end Jason Jones will be one of 22 former or current NFL players to participate in a four-day NFL boot camp on franchising. It starts Friday at the University of Michigan’s Ross School of Business which is named for Stephen Ross, the owner of the Miami Dolphins. Speakers will include franchisees, franchise owners, professors and former players, as well as executives at the International Franchise Association. Ross, the chairman and founder of Related Companies, an international real estate firm, will open the program as the keynote speaker. In addition, former NFL players with franchise ownership experience, including Tim Biakabutuka, owner of four Bojangles llocations; Angelo Crowell, owner of five Jersey Mike's Subs locations; and Van Jakes, owner of three McDonald’s locations, will take part in panel discussions. Others who will participate include former Lions cornerback Ron Bartell, New Orleans Saints quarterback Drew Brees and Atlanta Falcons wide receiver Devin Hester. If you missed Thursday's chat on the Lions, have no fear — you can read the transcript here. We had lots of talk about the Lions biggest needs and most likely pick in the first round. With the draft only two weeks away, it's a great time of year for speculation. Also the players will return to work on Monday for offseason workouts. While there are so many variables, that doesn’t stop the speculation about the NFL draft that starts on April 30. 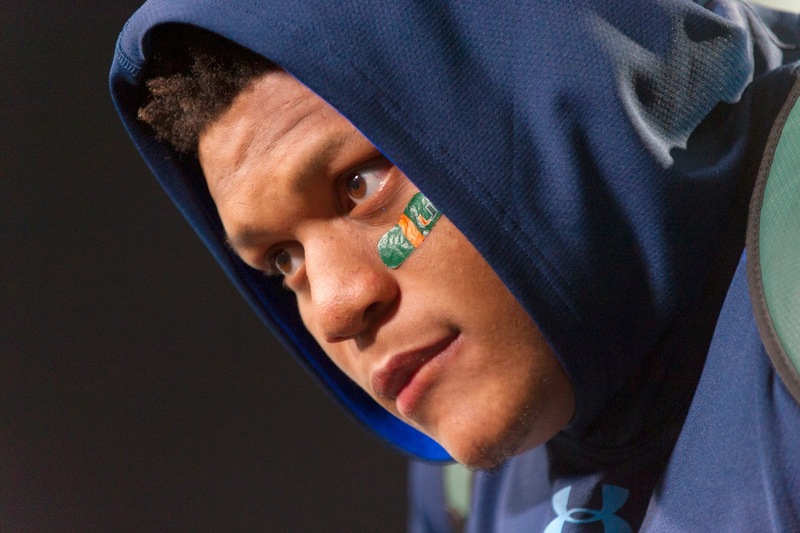 Offensive tackle Ereck Flowers (Miami-Fla.) could step in and immediately upgrade the Lions’ offensive line. At 6-foot-5 and 324 pounds, Flowers (in photo at right) is an intimidating and physical presence. Frank Cooney of TheSportsExchange.com calls him a “mean-spirited mauler who loves to outmuscle opponents until the whistle stops blowing.’’ He’s played both sides so could step in at left or right tackle. Defensive tackle Malcom Brown (Texas) has been connected with the Lions in mock drafts for months. Why? He’d be a good fit. He’s got experience, maturity and size (6-foot-2, 319 pounds). Offensive tackle T.J. Clemmings (Pittsburgh) is a defensive end who turned himself into a right tackle. Because of his athletic upside some draft experts believe he could be the first offensive lineman off the board. Wide receiver Breshad Perriman (Central Florida) would, of course, be the best story since his dad, Brett Perriman, was a solid wide receiver for the Lions from 1991 to 1996. The older Perriman is 5-foot-9, but his son is 6-foot-2 and uses his size and strength to make a catch. It’s his speed that has boosted him up the draft boards. He ran a 4.26 40-yard dash at his pro day. He’s one of three wide receivers the Lions welcomed for pre-draft visits. The others were Louisville’s DeVante Parker and UAB’s J.J. Nelson. The Lions have announced their preseason opponents and the basic schedule. The exact dates and times will come at a later date. They will open in the first week (Aug. 13-17) at Ford Field hosting the New York Jets for the second time in three years. Detroit and New York have met only five times in the preseason, and Detroit holds the edge in the preseason series, 3-2-0. In Week 2 (Aug. 20-24) they will play the Redskins at Washington. The teams last met in the preseason in 1996, with Detroit claiming victory, 34-25. In Week 3 on Aug. 28, the Lions will play the Jaguars at Jacksonville in a game on CBS. This is generally considered the key preseason game. It’s the second consecutive season for this matchup. Detroit owns a 2-0 record in the preseason series against Jacksonville. To wrap up the preseason schedule, the Lions will host the Buffalo Bills in the 35th preseason meeting between the two teams on Sept. 3 or 4. The Lions lead the preseason series 22-11-1, including wins the past seven years and a 23-0 win in 2014. The regular season schedule is expected to be released in the next few weeks prior to the NFL draft which starts on April 30. The Lions home opponents in 2015 will be: The Chicago Bears, Green Bay Packers, Minnesota Vikings, Arizona Cardinals, Denver Broncos, Oakland Raiders, Philadelphia Eagles and San Francisco 49ers. The road opponents: The Kansas City Chiefs in Week 8 of the regular season at Wembley Stadium in London on Nov. 1. Other road opponents: Chicago Bears, Green Bay Packers, Minnesota Vikings, New Orleans Saints, San Diego Chargers, Seattle Seahawks and St. Louis Rams. The Lions have agreed to trade defensive end George Johnson to the Tampa Bay Bucs for a late-round pick, per Rick Stroud of the Tampa Bay Times. The Bucs had offered a deal to Johnson for $9 million for three years. 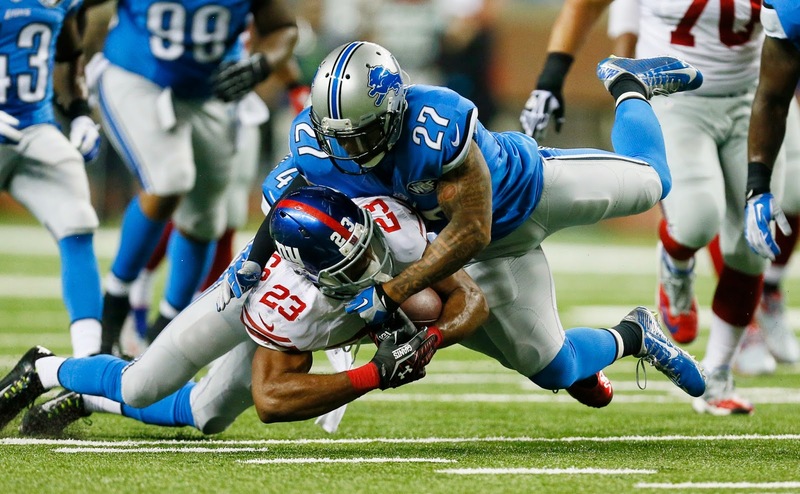 The Lions had a right to match the offer but instead were contesting it according to the NFL. An impartial arbitrator was expected to make a decision. The trade nullifies that. Johnson, who is 27, came to Detroit last season to add depth but was a good surprise from the get-go. He had six sacks in 16 games. He got many of the snaps that were expected to go to Devin Taylor. — Ziggy Ansah will start at one end. Ansah just keeps improving. Look for more of a leap this season because he’ll have his first full offseason of workouts with the team. Last year he was coming off surgery. He had 7.5 sacks in 2014 with three forced fumbles and 49 tackles. 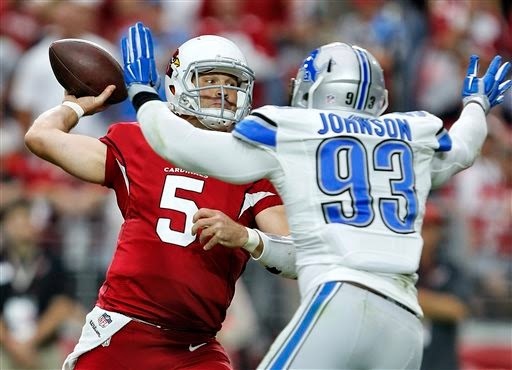 — Jason Jones is expected to start at the other side after playing his first full season with the Lions in which he had five sacks, two forced fumbles, five pass defenses and 22 tackles. — Darryl Tapp who played in all 16 games last season finishing with a half-sack, two pass defenses and 17 tackles. — Devin Taylor should be ready to get more involved in the defense. He had one sack with limited time on defense last season and 2.5 sacks in his rookie year in 2013. — Larry Webster could be the X-factor here. Webster, a fourth-round pick last year, made tremendous strides last season even though he didn’t play. Jim Caldwell practically raved about his improvement (very un-Caldwell like) when asked about Webster in December. — Phillip Hunt, who played in 22 games for the Eagles in 2011 and 2012, was signed as a free agent.